Thin, but exactly what I expected. Doesn’t need a pad on my tile floor. I am using it in my dining room, so didn’t want something too thick or shaggy, but it keeps everything from sliding all over the tile and looks nice. I would say it has a lot of grey undertones, and one end of mine is definitely lighter (more “distressed”) than the other. Also not really a purple, more a fuscia with mustard orange, navy, and teal. Nice rug and I do recommend. I love this rug! 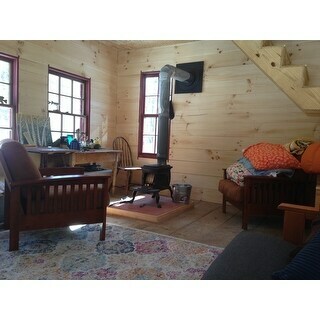 The colors are perfect for my family room. It really brightened up the room. My sofa is gray and blends very well with it. I like that I could add colorful throw pillows that pick up the colors in the rug. When I first unrolled it, it was curled a little at one end. It flattened out in about a day. I have it sitting on top of carpet. So far, it stays in place. Because it's color is on the lighter side, pet hair is not as very visible. I would recommend this rug as an easy, affordable way to brighten up a room. I am so happy with this rug. I had always had very neutral, zero-pile rugs because I have pets. When the time came for a new rug, I wanted color. 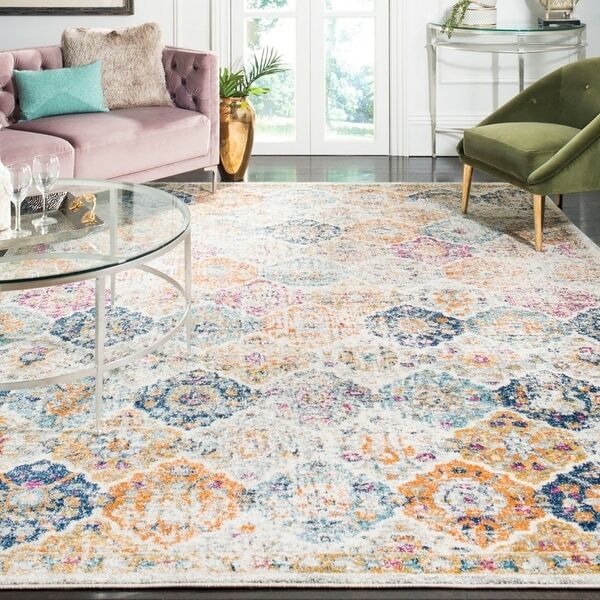 The reviews of this rug say every different thing possible about the colors - brighter than pictured, lighter than pictured - but I was ready for whatever showed up. There is a huge variety of colors in the rug, but none are overpowering. Whatever you put next to it is the color you notice in the rug. The colors are not overly bright because of the lighter background. The print is distressed, meaning it has the look of time worn color in places. This is not a defect, but a characteristic of the print. Having pets, I thought this would be a benefit in the long run and after several months, I was right. It is low pile, but has a very nice feel underfoot when new. After a time, the pile crushes as you'd expect, but the rug is still comfortable and looks great. I like this rug so much that when another rug across the room had to be replaced, I bought the smaller version of this same rug. Coincidentally, when a friend of mine was looking for a new rug, she posted a photo of this same rug and asked where she could find one like it because she loved it. We had a laugh and I pointed her to Overstock. No wonder we are friends, we like the same thing. It is a very versatile design. 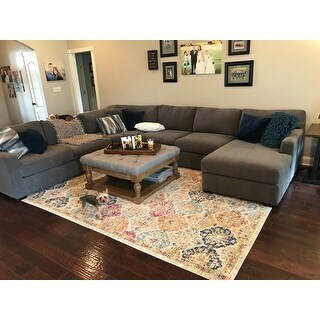 This rug is not only beautiful, but the quality is also amazing and way more than I expected for the price. I highly recommend this rug!!! Colors are perfect! This rug is absolutely stunning!! I love that it is colorful but the colors are muted in a vintage-style. You are able to see them but they don't overpower you with color. I bought and additional 3 in other sizes. The colors are perfect for my bedroom. I would recommend this rug to anyone. I have a lot of gold in my room and this rug accents the gold colors. 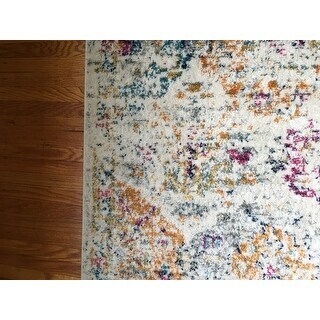 The Safavieh Madison Bohemian Vintage Rug is beautiful. I have had it for almost a year now and it shows no wear. I have the Mohawk Ultra Premium Rug Pad underneath. I ended up buying another one. This rug is actually stunning in-person. It has small hints of pink in it. Don’t turn up your nose just yet. I never thought I’d like pink in a rug in my house either, but it’s so good! 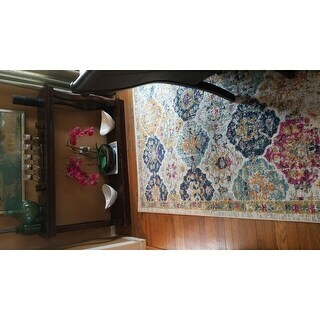 I get lots of compliments and the rug lends itself to so many styles (traditional, bohemian, shabby chic). Overall, a solid purchase. 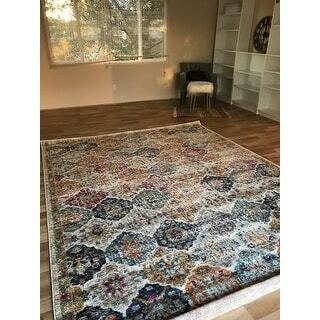 I LOVE this rug, its big and beautiful and I did buy both bohemian style distressed rug and they look amazing in my home. Just received this rug and I am loving it. Nicely made and it's exactly like picture. I’m happy with this purchase. 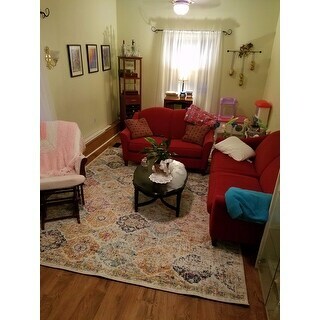 The Overstock app made choosing an area rug easy. Delivery was quick. I unrolled the carpet right away and let it air out overnight, in my patio room. There’s definitely a strong “new carpet” (chemical) smell at first, but that’s to be expected. I sprinkled a whole box of baking soda across the carpet while it aired out, to help absorb the odors. It really helped to remove the chemical smell, and it vacuumed up easily. The carpet looks great. Great carpet, beautiful faded colors, looks great and colors allow for good mix of colors in furniture in room. 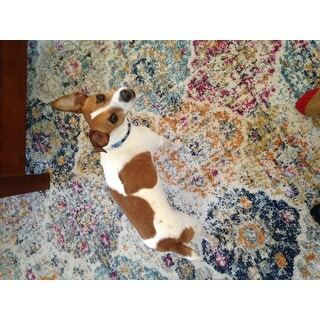 Good quality rug. This rug is even more gorgeous in person than in the pictures! Very vibrant and full of color! Looks beautiful in my dining room! And what a great price! I absolutely love this rug! I have it on a cherry hardwood floor and the contrast is beautiful. Also the multitude of colors in the rug make it easy to put with almost any decor. Great quality. Product looked just like images on website. Love this rug! Lots of compliments. Does not move and slip on hard floors. Cleans up well. Easy to take care of. Its easy to clean and it hides spots and strains. This rug is the perfect thickness and coloring for our living room. It is easy to vacuum and clean. Exactly as pictured, everyone loves it! The rug is a thin low pile rug, so my dyson has no trouble with it, but if you’re wanting something plush, this isn’t it. I love this rug. It’s beautiful. If you are thinking about it, buy it. I bought it for my spare bedroom and it’s perfect. 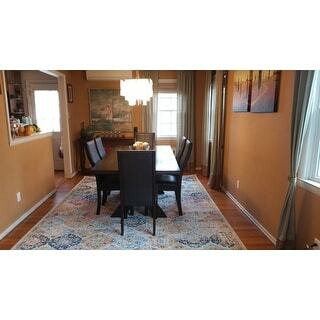 Your accent colors can be any of the 50 colors from the rug, you have so many options. Great Price! Soft! I put down a rug pad. Lays a little curled at first, but colors are soft and vibrant at the same time. Low pile is easy to clean. Have gotten lots of compliments on this rug. "Is this big enough to go under a king size bed?" 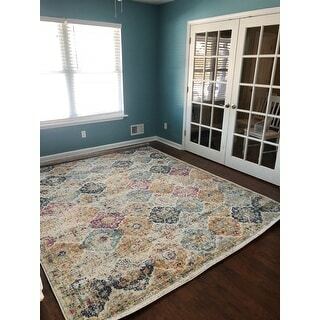 This rug measures 8' x 10'. Please note sizes can vary up to a couple of inches. Yes! It’s plenty big. I have a king size bed and rug fits great under it. Yes, I have mine over carpet. It slips around a little if you don't have a rug pad under it. "What is the exact size of this rug?" 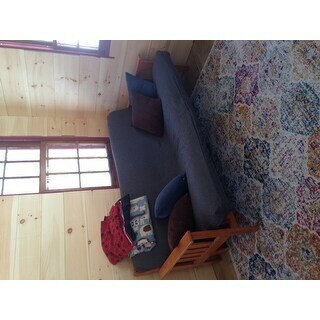 It is 8 feet wide and 10 feet long It is a nicely bounded on all edges.I recently purchased this item. Mine was 7'6"x10'3". So dissapointed. "Is the red tag sale final sale or if I purchase a rug but it isn’t matching my other pieces, am I able to return it?" "I would like to use this in a dining room with a black table and orange chairs. Will this rug work with orange? Is there orange in the rug?" Yes, there is an orange hue as one of the many colors in the rug! No black though. I think it would be just fine. In fact, I think the rug would match any color! Yes there is orange in the rug. "Is there any shade of green in this rug?" No there is not, there's kind of a mustard orange, a magenta, and shades of blue/aqua. "Did your rug have a lot of bend marks when it arrived and how did you get those marks to relax?"